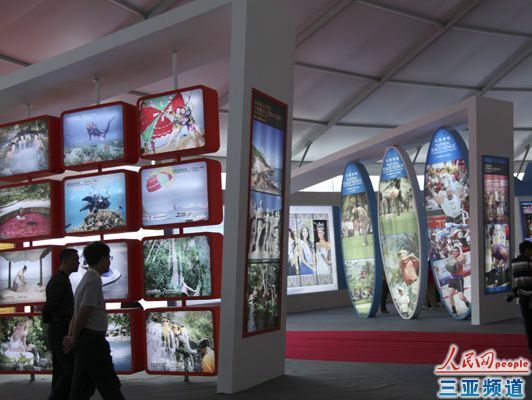 10 theme pavilions for VOR Sanya stopover officially opened to the public on the morning of Jan 21, 2012 and will last until Feb.19. According to the organizing committee, the pavilions are open free to the visitors and the public can get the entrance tickets at several fixed locations including related star-related hotels, Sanya Luhuitou’s Peninsula Sailing Port, official tourism information centers. The 10 pavilions, running from 10:00am to 10:00pm everyday, feature different themes include Sanya Pavilion, Yalong Bay Pavilion, Haitang Pavilion, Orchid Pavilion, Rose Pavilion, Yacht Pavilion, Real Estate Pavilion, Creativity Pavilion, Science Pavilion and InterContinental Pavilion. To further bring convenience for visitors to the Destination Village, 4 special bus routes service are opened at Mingzhu Square, Dadonghai Square, Yalong Bay Square and Sanya Bay during the period. Departure time for the public transport is set from 9:00am to 21:00pm everyday and the return time runs from 11:00am to 22:00pm.